Mikrotik RouterBOARD 532r5, 266MHz (400MHz factory tested) MIPS CPU, 32MB DDR RAM, 3 LAN, 2 miniPCI, 128MB NAND with RouterOS L4 - Sorry we can't order these any more from Mikrotik. 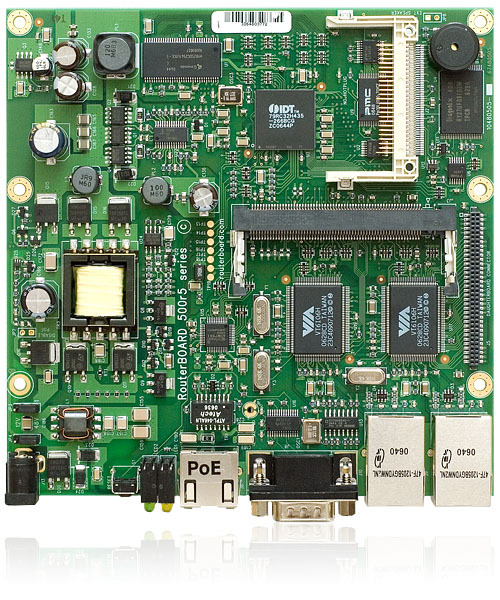 We still have RB/532a in stock which is the same board with more RAM and a faster CPU. Mikrotik RouterBoard CCR1036-8G-2S+EM Extreme Performance Cloud Core Router with 8-10/100/1000 ethernet ports, 2 SFP+ ports and RouterOS Level 6 license - New! 24vdc 96 watt (4 amp) open frame switching power supply with Molex DC plug - replacement PSU for Mikrotik Cloud Core Routers Mikrotik RBSXTsq5HPnD (export version) is a low cost, high speed 5GHz wireless device. Dual polarization 802.11n and Nv2 TDMA technology help to achieve even 200Mbit real throughput speed - New!